Full credit for my awareness of Australian author June Wright has to go to Kate over at CrossExaminingCrime, who reviewed Wright’s debut Murder in the Telephone Exchange last year and made it sound fabulous. Rather than re-evaluate that book, I thought I’d go for one of Wright’s later efforts and so find myself with this, her…well, it’s a little complicated placing this in the timeline. Derham Groves’ excellent introduction informs us that Wright wrote this after her fourth book – making it, you’re correct, her fifth – but this 2015 imprint is in fact its first publication as it was rejected by two publishers, so therefore it’s her seventh book as it comes after the six she published. Oh, except she also had another book rejected, too, but the manuscript for that has been lost, so this is…hang on…carry the one…well, work it out for yourselves. And in the grand tradition of Derek Smith’s Come to Paddington Fair and Hake Talbot’s vanished-from-history unnamed third novel, this joins my collection of “Seriously, this was rejected?” books that make one question precisely what or indeed if anyone was thinking at the time. “The detective story is just as much an artistic expression-” began Charles defensively. Years of easy living and the rigid social code of Anglo-Indians had left Mrs. Dougall incapable of adjusting herself to a new and cruder life. She clung to the old standards by building a protecting wall of memories of the halcyon Indian years between herself and the sordid realities of the present, behaving, thinking, speaking, and even dressing precisely as she had done then. Being a strong-minded woman, she succeeded in bolstering up the Major’s flagging morale, so that he almost completely joined her in the happy self-deception. Without her, no doubt, he would have long since pressed his old service revolver to his highly coloured forehead. The tone throughout combines an Australian’s command of dry throwaways matched with an Englishman’s sarcastic remove, with one character “behaving with the urbanity of a man who doesn’t allow his temper to get ahead of his intellect” and the local policeman conducting his work “under the ferocious hirsute gazes of by-gone custodians of law and order” (plus, of course, a great many others I’m reluctant to spoil). There is, you’ll have gathered, that faintly-restrained sense of mischief sedately running amok rather than anything close to grand slapstick set pieces – Wright reminds me of Constance and Gwenyth Little on their better days, and maintains an admirable fealty to the rules she is picking apart. This means that she also serves up a classically rugose piece of detective plotting, with elements inflated to catch your eye while seams of red herrings weave quietly amongst them (I was following one false trail right to the end, missing the killer completely) – odd to think that the preponderance of misleading clues was a complaint one of the readers had which lead to this being rejected…did they not know that that’s how this type of crime fiction works? Well, we’ll never know. At 170 B-format pages this lacks real complexity but also has no qualms about getting on with things, and Wright demonstrates an economy of prose that always goes over well with me – in particular the description of the murder when it happens is a startlingly compact piece of writing, and really quite special to witness. Verse Chorus Press, via their Dark passage imprint, have done a great job producing this, too. The introduction contains the original cover and the front page of Wright’s original manuscript, helping me date this book as above and providing some lovely context. That they list all six of Wright’s published novels in the front gives me hope for the others seeing the light of day soon (they have already published her debut and follow-up, So Bad a Death). It would be no less than June Wright deserves on this evidence. I submit this review for the Golden Age Vintage Cover Scavenger Hunt at My Reader’s Block under the category Dog. The Hake Talbot novel that vanished from history was not unnamed: The Affair of the Half Witness went missing after Talbot failed to find a publisher for it. I’ve a silent hope that a yellowed manuscript will turn up one of these days, but I fear the worst. Luckily, there are a couple of manuscripts, from the likes of Anthony Boucher (The Case of the Toad-in-the-Hole) and Christianna Brand (The Chinese Puzzle), which were saved after being rejected. 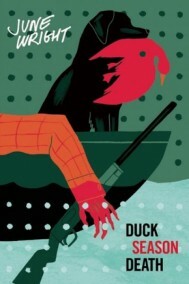 June Wright’s Duck Season Death gives me the hope that they, too, will eventually be published. TomCat you are, as ever, a wonder! I had no idea there was a title for the Talbot, I was half-expecting it to be apocryphal. Okay, publishers, get searcing…! Personally, I hope that somewhere, somehow Joseph Commings’ One for the Devil is re-discovered, which is one of four lost manuscripts by this locked room artisan and was described as a John Dickson Carr-style mystery about two impossible crimes. I could probably struggle through life without The Affair of the Half Witness, but One for the Devil has haunted me ever since I read about it in Banner Deadlines and impossible to accept that it might be lost forever. The manuscript is probably collecting dust somewhere and will eventually turn up again… r-right guys? Interesting that you enjoyed this one so much. I read it last year and thought it OK but trying a little too hard to be ‘meta’ and didn’t think it was entirely successful. But I’ve got to read some more of hers before I make a final call on whether or not she is my kind of gal. Yeah, meta can be difficult to achieve well – The Smiling Corpse by Bernard A Bergmann (my first ever review on this site!) is a good example of it going poorly and swamping the resulting book. What I liked about this is that Wright managed to both wink at the genre and also write a decent whodunnit, without either destroying the other. Brilliant review. Definitely think I will have to try this one along with So Bad a Death. I’m intrigued about this one and its meta-fictional qualities, as in The Murder at the Telephone Exchange this is not a quality in evidence and also you do get a stronger sense of it being set in Australia. Part of me wonders whether DSD was a deviation in some respects from her normal crime writing style. Christianna Brand – The Chinese Puzzle?????? WHAT??? I Googled it and got a Chinese Blog. The only words in English were CHRISTIANNA BRAND, THE CHINESE PUZZLE (1963)….I have never heard of this. What is it??? PLEASE tell me! Dear God in heaven!!! Can we start a petition?! ?